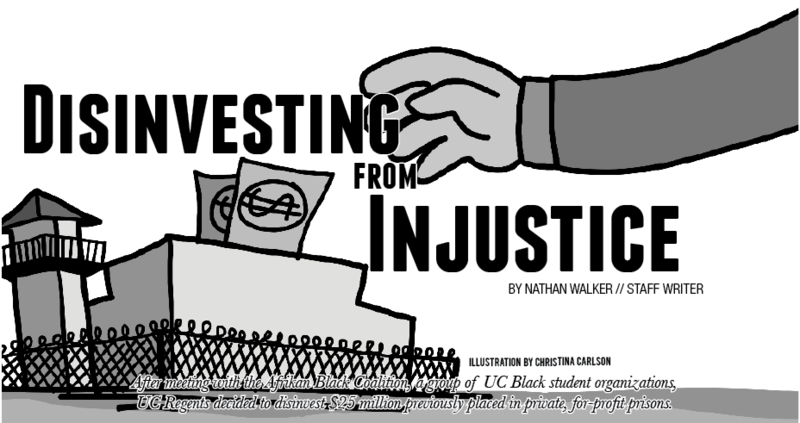 On Dec. 1, the University of California Regents decided to divest $25 million previously held in private, for-profit prisons after meeting with the Afrikan Black Coalition (ABC), a group of UC Black student organizations. In recent years, the ABC has helped lead protests and meetings decrying private prisons, a once small industry that has grown to a roaring multi-million dollar industry with substantial influence and power in our governments. The two largest private prison lobbying agencies, the Corrections Corporation of America and the GEO Group, have spent over $25 million on lobbying efforts in order to ensure their policies get promoted, according to the Washington Post. These two groups funnel large amounts of money to candidates who support a brutal and largely racist institution that brings over $3.3 billion in annual revenue amid a rising prison population. The UC Regents’ decision sends a strong message that the public is beginning to realize the dangers of privatizing our incarceration system and sheds light on the ethical concerns of universities investing in private prisons. Because of their close relationship with U.S. politicians, the CCA and the GEO are able to exert a significant amount of influence over how they are regulated. Unsurprisingly, this has led to a severe lack of regulation and transparency, reaping large profits from the privatization of the prison industrial complex. In 2013, the ACLU and Southern Poverty Law Center sued a Mississippi private jail after reports of cells “infested with rats and [lacking] working toilets or lights” according to the ACLU website. In California, a prisoner was found publicly beaten to death in a crowded gymnasium; prison officials only found out several hours after the inmate’s death according to the ACLU. These conditions are clearly unethical, and it would be a tremendous breach of ethics for an education system to support such a brutal industry. Even more shocking, however, is how seriously racialized our prison population remains. According to the ABC, “Black Americans make up 13 percent of the population, 14 percent of drug users, but make up of 56 percent of incarcerations of drug related crime,” a shocking disparity that needs to be addressed. Furthermore, almost 40 percent of the incarcerated population is black, yet only 13.2 percent of the U.S. population is black, according to the U.S. Census. This huge racial disparity stems from subtly racist laws that encourage strict, mandatory prison sentences, especially for drug offenses which tend to have higher conviction rates among communities of color. Racial disparity in the U.S. justice system is so bad that many authors have compared it to modern-day slavery. Though this sounds like sensationalist politics the analogy is far more apt than it would initially seen, as many private prisons force inmates to work for anywhere between 93 cents and $4.73 a day according to Alternet. Furthermore, the vast majority of inmates lack worker protections and are under constant fear of abuse or violence from their employers or fellow inmates. This is barbaric and reminiscent of sweatshop labor. If UC Regents had decided to continue their investments, this would have effectively disregarded the importance of stopping the industrial prison complex. Unsurprisingly, groups like the CCA and GEO are heavily in favor of mandatory sentencing laws that racialize the prison population. In California, private prison lobbying groups indirectly supported the three-strikes law, a controversial measure that mandates prison sentences for repeat offenders and has helped the California prison triple between 1985 and 2010 according to the CA Department of Corrections and Rehabilitation. In Arizona, the CCA and GEO supported SB 1070, a measure that makes it a misdemeanor for any suspected immigrant not carrying appropriate documentation, according to the Washington Post. The private prison industry quickly saw this as a way to increase prison population and donated thousands of dollars in support of a measure that was considered racial profiling by many human rights groups. Clearly, private prisons have no qualms about sentencing hundreds of people to jail time over racist laws, but universities should not be supporting such actions. The UC Regents and the ABC have helped call attention to these issues by taking an important stand. It was unethical to force students to support the prison industrial complex with their student fees, as they were likely breaking the UC Code of Conduct which prohibits “conduct that threatens the health or safety of any person.” The University of California system cannot and should not support a system of oppression, racism and incarceration. It is encouraging that the UC Regents are listening to students and recognizing that money needs to be invested ethically and fairly. They made the right decision by divesting from a system that has disenfranchised communities of color for generations.